Besides its world-famous artistic attractions and landscapes, the Tuscan Maremma enjoys well-deserved fame in the field of food and wine. While wine and extra-virgin olive oil represent the territory’s flagship products, for many years now other gastronomic products of Maremma such as its excellent pecorino cheese or its fish and fish-farming products have increasingly taken center stage, all within a framework of protecting and enhancing the traditional agri-food products. For food and wine lovers, Maremma offers old flavours, culinary traditions inspired by a wholesome cuisine based on simple but mouth-watering ingredients. The delicious specialities offered by a land so rich in culinary and wine-making traditions are countless. The superb quality of Maremma’s food and wine alone is worth a trip in this province. Setting aside the lure of the sea, the hills or the mountains, a bowl of acquacotta, the quintessential dish of Maremma cuisine, or the mouth-watering pappardelle pasta in hare sauce, or the tortelli stuffed with chard and ricotta cheese dressed in various meat sauces, are enough to warrant a trip and a sojourn in this land. Maremma’s classic dishes are accompanied by fine DOC [Controlled Origin Denomination] wines that exalt the singular flavours of local culinary tradition, and by the prestigious Tuscan IGP (Protected Geographical Indication) extra-virgin olive oil. Maremma offers an abundance of “food and wine roads” to connoisseurs and travellers. The following renowned Wine Roads are worth mentioning: "Colli di Maremma" (Hills of Maremma), which touches on thirteen Maremma towns: Campagnatico, Capalbio, Grosseto, Isola del Giglio, Magliano in Toscana, Manciano, Monte Argentario, Orbetello, Pitigliano, Roccalbegna, Scansano and Semproniano. Along this road we find a D.O.C.G. (Controlled and Guaranteed Origin Denomination) wine, Morellino di Scansano and four D.O.C. wines Ansonica dell'Argentario, Bianco di Pitigliano, Capalbio, Parrina and Sovana. An additional D.O.C. 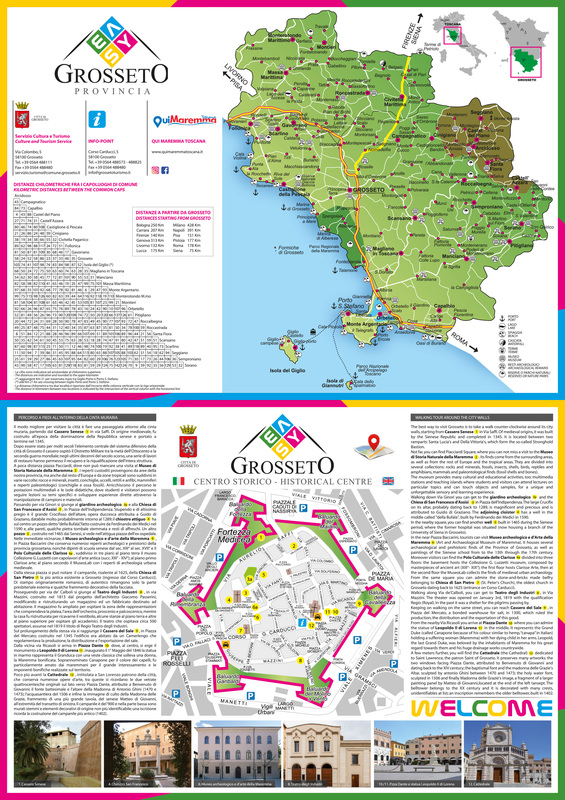 wine road, the "Monteregio-Massa Marittima", crosses eight towns in Maremma territory: Massa Marittima, Monterotondo, Montieri, Follonica, Scarlino, Gavorrano, Roccastrada and Castiglione della Pescaia. The most recent wine road, the "Montecucco", is distinguished by the original flavours of a wine born on the slopes of Mount Amiata and runs through ten towns of the Maremma: Arcidosso, Campagnatico, Castel del Piano, Castell'Azzara, Cinigiano, Civitella Paganico, Roccalbegna, Santa Fiora, Seggiano and Semproniano. Along this road, we find the wine of the same name, the D.O.C. Montecucco Wine.